Dionisio Aguado was born in Madrid on April 8, 1784. He studied guitar with Miguel Garcia. in 1825, Agaudo visited Paris and became friends with Fernando Sor. The two of them shared residence in Paris for a time. Sor wrote Les Deus Amis , for Aguado and himself. Aguado’s style differed from Sor’s in that he used his nails extensively and used a lot of extremely fast scales. His guitar had a shorter scale than most, to facilitate his style of playing. His virtuosity attracted the attention of Rossini and Paganini. Aguado, along with Sor and Giulliani, was concerned with the reformation of guitar notation. His pedagogical work, Escuela de Guitarrawas published in 1825. It is still in print today. Aguado returned to Madrid in 1838 where he died on December 29, 1849. Aguado wrote hundreds of minor works, including many studies for his students. His six major works include Andante & Rondo in A minor, and Le Fandango Varie. 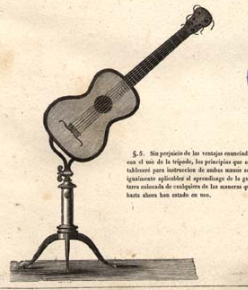 In an effort to achieve unfettered sound and technique from the guitar Aguado invented a device to hold the guitar he called the “tripodium.” Many guitarists testify that he has succeeded. In fact, the tripodium has been copied by many others wishing to capitalise on its success.